France opened up its 2018 FIFA World Cup campaign in Group C with a win, but it didn’t look sharp in doing so. 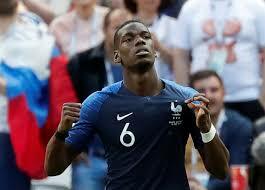 One of the favorites to win on paper, France beat Australia 2-1 on Saturday, needing a penalty kick confirmed by the video assistant referee and some late magic from Paul Pogba (and help from goal-line technology). A scoreless first half saw both teams with chances, but things got going early in the second half.Antoine Griezmann was taken down in the box, and the video assistant referee team was used to help the head official overturn a penalty kick call.It’s the first-ever use of VAR at a World Cup game. History was made and Griezmann soon after converted the spot kick to give the French team an early lead in the 58th minute. But just moments later, Australia was awarded a penalty of its own thanks to a bonehead handball by Samuel Umtiti. And though the match looked headed for a draw, there was still a goal left in it, as Paul Pogba kissed the ball off the crossbar and just over the line in the 81st minute. A good result for France, but this dynamic attack was anything but. We may see some tactical changes from Deschamps moving forward. As for Australia, it just let Denmark and Peru know that it will be no easy match and it has the capability of moving on to the round of 16 if it can put it together in the final two matches.